Installing a car stereo by yourself not only saves a lot of money but also brings you much satisfaction, therefore, many car owners have tried and successfully achieved the installation on their own. 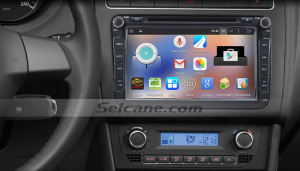 If you have the same dashboard as the picture below which is a great Seicane 2003-2010 Skoda ROOOMSTER car stereo after installation, then you can take the following detailed Skoda ROOOMSTER car stereo installation guide as a reference. This modern Skoda ROOOMSTER car stereo can support a lot of practical features and entertainment functions. The most accurate guidance and voice prompts provided by the GPS navigation system will lead you to your desired destination in the quickest way. The connection with your Bluetooth-enabled mobile phone and this unit enables you to have hands-free calls and stream music so as to keep you a safe and pleasant journey. Your steering wheel control can still work after installation. Wish you have a wonderful time with this amazing Skoda ROOOMSTER car stereo on all trips from now on! Good luck to you!